The annual one month long Kazincbarcika Kolor Fesztival also kicked off last week, and on Monday we travelled to Edelény to see an unfamiliar band. Last year we went to Dubicsány to see Bea Palya. Maszkura és a Tücsökraj played in the courtyard of the local Borsod Museum. We had no idea what kind of music it would be, but it was close and Kata had the evening off. An improvement on last year was a big food wagon parked off to the side offering fast food like burgers, hotdogs, gyros and shish kabob. Unfortunately the beer was not fresh. After the 1st five songs we were ready to run for it, but then it got better. The band are good musicians, and obviously enjoy themselves on stage. I could have done without the rap, but it was not too bad. 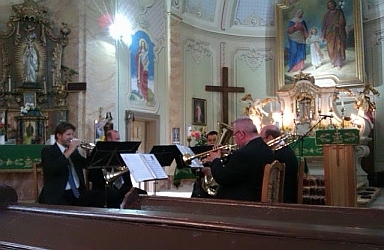 It was much more enjoyable when they played funky stuff. Besides the usual drum kit, bass, synthesiser and electric guitar, they mixed it up with a slide guitar, voice-synthesiser guitar and accordion. When the lead vocalist sang a song with Pinocchio in it, the coin finally dropped and I understood the lead singer's getup with top hat, long black coat and pointy shoes, as well as the cricket in the group's name - Jiminy Cricket. In the end we were glad we went. Lastly, we planted out salad, beet, garden rocket and cabbage seeds for one last sprint before winter. We processed zucchini relish and sauerkraut, and made white gazpacho and a cooling cucumber drink. The tomatoes have finally begun ripening - we are just hoping there is enough time. 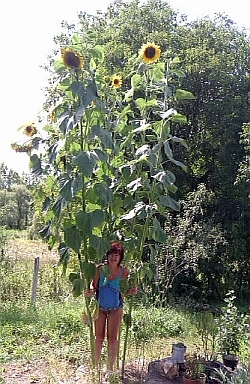 The sunflowers are close to 4 meters tall and have finally flowered.